The emergency release rope is a basic component of all garage door openers. As its name suggests, it is very useful in an emergency situation. Our experts will always check the condition of the rope during our maintenance services and check that you know how this system works. It's important to report any problems with the release cord since these are important components for your safety. Why Is The Emergency Release Important? Emergency cords are installed to disconnect the opener and make it possible to manually open the door during a power failure or when the opener stops functioning. The rope will also be extremely important in the event that someone or something gets trapped and you need to release the door quickly from its automatic function. This is why it's so important to know how to use the emergency release - you want to avoid making mistakes that might put a life at risk. 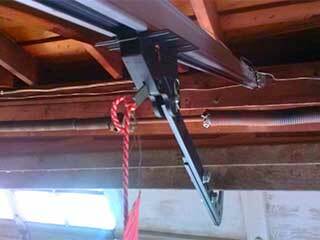 Although there are some slight differences between types of garage door opener, the rope is usually released by pulling it down and towards the door. For square rail openers, if your intention is to release the arm from the trolley, it must turn to a vertical position so pull the rope down. For T-rail openers, you just need to pull the rope down and towards the opener. What Happens When I Trigger The Emergency Release? In both of the above cases, the emergency release will disconnect the opener system, enabling you to move the door manually. If you want to reconnect the automatic function, you should pull the rope down again and in the case of square rails, a tad towards the opener. The trolley will be reconnected next time you put the door in operation. Always disengage the opener through the release red cord when the door is down and make sure there is no-one near the door when you do this. You should check that the rope is tied tight before an emergency occurs. For any more information and assistance regarding your emergency release system, don't hesitate to contact our technicians at Garage Door Repair Sacramento - we're here to help!